Billionaire globalist George Soros paid various firms tied to Fusion GPS and Trump-Russia dossier author Christopher Steele over $3.8 million in 2017, according to IRS filings. The payments made by the Democracy Integrity Project are over three times what the DNC and Clinton campaign paid fusion GPS and Steele during the 2016 presidential campaign to investigate Donald Trump’s possible ties to Russia. Truepundit.com reports: Perkins Coie, the law firm that represented the DNC and Clinton campaign, paid $1 million to Fusion GPS in 2016 to investigate Trump. Fusion GPS in turn paid Steele, a former MI6 officer, nearly $170,000 for a project that resulted in the infamous Steele dossier. Steele’s report, which alleged a “well-coordinated conspiracy” between the Trump campaign and the Russian government, has come under intense scrutiny in the wake of the special counsel’s findings in the 22-month Russia probe. Daniel J. Jones, a former staffer to California Democrat Sen. Dianne Feinstein, founded TDIP on Jan. 31, 2017, seemingly to resume Democrats’ investigation of Trump’s possible links to Russia. Jones operated what he called a “shadow media organization helping the government” to investigate Russian meddling in the 2016 election. He also told the FBI in March 2017 that he received funding from a group of between seven and 10 wealthy donors and that he planned to provide information to federal investigators, the press and lawmakers. TDIP’s tax filing confirms some aspects of what has been reported about the group. The 990 form lists five separate independent contractors, including four that provided “research consulting,” and one law firm, Zuckerman Spaeder. The group paid $3.3 million to Bean LLC., the holding company that controls Fusion GPS. Another $250,000 was paid to Walsingham Partners Ltd., a London-based firm owned by Steele and his partner, Christopher Burrows. TDIP paid another London-based intelligence firm called Istok Associates Ltd. nearly $150,000, also for “research consulting.” The company has released investigative reports looking into whether Russia helped fund the Brexit campaign. Nearly $130,000 was paid to Edward Austin Ltd., a London-based intelligence consultancy operated by Edward Baumgartner, a Fusion GPS contractor. Another $148,000 was paid to the law firm Zuckerman Spaeder, which has represented Fusion GPS in a variety of dossier-related legal matters. The full extent of TDIP’s work remains a mystery, as do the identities of most of the organization’s donors. Real Clear Investigations reported on March 20 that TDIP sends out daily newsletters with a roundup of news stories about the special counsel’s investigation and other Trump-related matters. Jones has also taken credit for planting anti-Trump news stories. Adam Waldman, an attorney with links to Christopher Steele, revealed text messages showing that Jones took credit for a Reuters news article that raised questions about Russian purchases of Trump properties in Florida. “Our team helped with this,” Jones wrote Waldman on March 17, 2017, in a text message provided to The Daily Caller News Foundation. 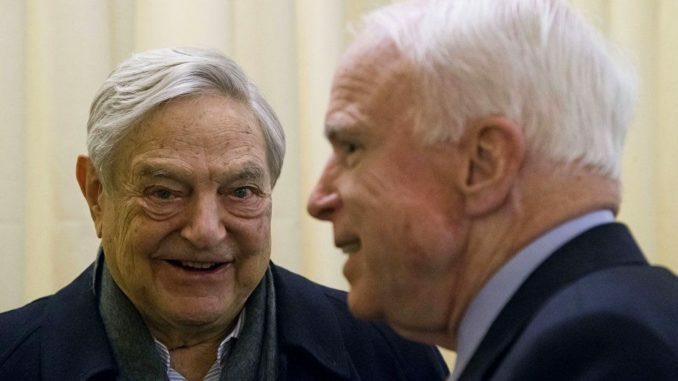 Waldman testified to the Senate Intelligence Committee in November 2017 that Jones told him that Soros, the progressive billionaire financier, was one of TDIP’s backers. That was confirmed in October, when The New York Times reported that Soros donated at least $1 million to TDIP. TheDCNF has since found that a California-based nonprofit called the Fund for a Better Future (FBF) contributed nearly $2.1 million to TDIP in 2017. It is not clear who provided the donation to FBF as the group does not disclose its donors. According to TDIP’s tax filings, Jones’ group received just over $7 million in contributions in 2017 and spent close to $5 million. Of that, Jones received a salary of $381,263. Another $95,914 was spent on travel. TDIP’s link to Istok Associates has not been previously reported. The company’s founder is Neil Barnett, a former journalist who has recently investigated possible Russian influence in the Brexit campaign. Barnett co-authored a report released on Oct. 17, 2018, for The Atlantic Council, a Washington, D.C. think tank, which focused on British businessman Arron Banks’ contributions to the Brexit campaign. Barnett also suggested in the report that the Trump campaign received millions of dollars in illicit donations, possibly from foreign adversaries. Barnett’s argument hinged on a large amount donations under $200, which is the cutoff point where donors are required to disclose their names and addresses. Politicians typically hype small-dollar donations, which are seen as one gauge of grassroots support for political campaigns. But Barnett seemingly saw something more nefarious in the outsize ratio of small-dollar contributions flowing to the Trump campaign. There is no evidence that TDIP was involved in Barnett’s report for The Atlantic Council. One of TDIP’s founders and board members is Adam Kaufmann, a former prosecutor in the Manhattan district attorney’s office. In private practice, Kaufmann served as an attorney for Derwick Associates, a Venezuelan firm that has come under scrutiny for money laundering and embezzlement. Derwick hired Fusion GPS in 2014. Reporters and human rights activists have claimed that Kaufman and Fusion GPS co-founder Peter Fritsch pressured them to back off stories critical of Derwick. Baumgartner, the Edward Austin Ltd. executive, has worked for years as a Fusion GPS contractor. Glenn Simpson, another Fusion GPS co-founder, said in congressional testimony in 2017 that Baumgartner helped the firm with an investigation of London-based financier Bill Browder, who is the leading proponent of the Magnitsky Act, a sanctions law opposed by the Kremlin. After the Steele dossier was published by BuzzFeed in January 2017, Fusion GPS tapped Baumgartner to conduct a background investigation of Aleksej Gubarev, a Russian businessman accused in the dossier of having been recruited as a Russian spy and of hacking DNC computer systems. Gubarev vehemently denied the allegations and filed defamation lawsuits against BuzzFeed and Steele. Baumgartner’s report undercut the dossier’s claims about Gubarev. He found that Gubarev’s peers did not believe that he was working for the Kremlin to hack Democrats. TDIP has also been linked to a controversial technology company that has been implicated in a disinformation campaign that targeted a special election for an Alabama Senate seat in 2017. TDIP partnered with the tech company New Knowledge on DisInfo 2018, a project that aimed to track social media disinformation during the 2018 midterms. New Knowledge gained national attention in December after releasing a report in partnership with the Senate Intelligence Committee regarding Russian social media disinformation. Days later, New Knowledge came under fire for using bots and fake social media personas in the Alabama special election. Jones operates another nonprofit group that appears to focus on the same issues as TDIP. On Jan. 29, 2018, Jones registered Advance Democracy Inc. That group received a $500,000 contribution last year from the Silicon Valley Community Foundation, a donor-advised fund that masks its contributors. Jones founded Advance Democracy four days after Iowa Sen. Chuck Grassley, the former chairman of the Senate Judiciary Committee, released a letter seeking information from associates of Fusion GPS and Steele. TDIP did not respond to a request for comment.